Many presidents were happy to be leaving behind the awesome responsibilities of office. Outgoing President James Buchanan told his successor, Abraham Lincoln: "If you are as happy, my dear sir, on entering this house as I am in leaving it and returning home, you are the happiest man in this country." And, John Adams wrote what he believed the departing George Washington was thinking: "Ay! I am fairly out and you fairly in! See which of us will be the happiest." In 1989, outgoing President Ronald Reagan left a message for his successor, George H.W. Bush, in the drawer of his Oval Office desk, beginning a relatively new inaugural tradition. With a header of "Don't let the turkeys get you down," Reagan wrote: "You'll have moments when you want to use this particular stationery. Well, go to it. George, I treasure the memories we share and wish you all the very best. You'll be in my prayers. God bless you and Barbara. I'll miss our Thursday lunches. 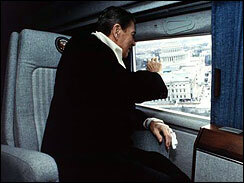 Ron"
As they circled the Capitol and the White House on their trip out of Washington, Ronald Reagan looked out the window of his helicopter at the White House. He patted his wife, Nancy, on the leg and said, "Look honey, there's our little bungalow." When his eight years as President of the United States ended on January 20, 1953, private citizen Harry Truman took the train home to Independence, Missouri, mingling with other passengers along the way. He had no secret service protection. His only income was an Army pension. Later that year, Truman bought a Chrysler New Yorker and got behind the wheel. He and Bess drove to Washington, New York and back home again by themselves. A feat no president had done before or since. The White House staff has just five hours to clear out the personal effects of one first family and move in those of the other. It's planned like a battlefield operation. Once the Obamas depart for the Capitol, the moving vans come to deliver the Obamas belongings and move out the Bushes. Ninety-five staffers take part, and it will all be finished by the time the Obamas return to the White House from the inauguration ceremony. 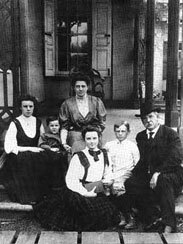 "Take good care of everything"
On the day Grover Cleveland left the White House - defeated after his first term - his wife, Frances, told the staff: "I want you to take good care of everything, the furniture, the china, the crystal, the silver. I want to find everything just as it is now when we move back in exactly four years from today." And, true to her word, the Clevelands did move back in four years later, when Grover became the first and only president to win a second, non-consecutive term.